Nóra Kavanagh M.A., M.A. B.A. Mus (Hons), ALCM, TTCT. Nóra studied classical piano and achieved honours at Grade 8 standard in both the RIAM and ABRSM examinations. Twice winner of the prestigious senior solo piano competition at the All-Ireland Fleadh Cheoil. In 1994 completed an ALCM on the Irish Traditional Flute. 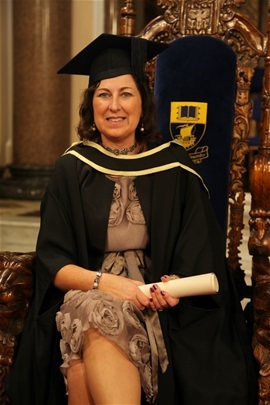 In 1990 Nóra studied for a Bachelor of Music Degree for four years at Waterford Institute of Technology and graduated with first class honours. This was a milestone for the college as Nóra was the first student to be awarded first class honours for this particular degree. As part of this course Nóra studied Music History, Irish Traditional Music, Ethnomusicology, Composition, Acoustics, Psychology, History, Singing, Orchestration, Conducting, Arts Administration and Performance (Classical Piano, Clarinet & Concert Flute). Following from the success of this degree Nóra then completed a Masters in music performance (Irish Traditional Flute) and research at WIT in 2001. In 2014 she also completed a second Masters. The focus of this was Teaching and Learning in Further and Higher Education. Nóra is also a Lecturer in the Department of Creative & Performing Arts at Waterford Institute of Technology specialising in Irish Traditional Music History & Performance. Other modules include general musicianship, aural skills, music theory and composition. Musical director with the group Craobh Nua who have performed in many venues including St. David’s Cathedral Wales, Christchurch Waterford City & as guests of the Mayor of Rochester, USA. In 2009, this dynamic group produced an inspiring CD titled ‘In Full Sail’. At present Nóra is Musical director with a new an innovative group titled 'Casóg'. They have just released their first CD titled 'New Light'.